Check out another free spins offer with a good deposit bonus offer like Slingo – Get 50 Free Spins on Starburst Slot at G’Day Casino. Slingo are back on our TV screens this autumn with a new ad and a sensational new sign up offer. 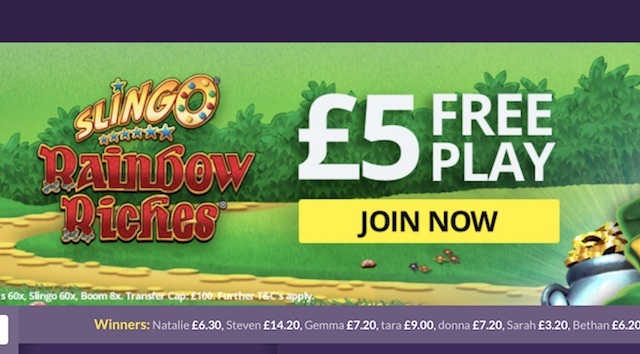 Join today and get a superb £5 Free – no deposit needed – to play their exclusive selection of Slingo games, including the brand new Slingo Rainbow Riches and Slingo Showdown. All you have to do to claim your £5 freeplay bonus is register and enter your credit or debit card details on the site. There is no need to make a deposit. Just add your card and Slingoforit! What Can I Spend My Slingo.com £5 Freeplay On? Once you have registered at Slingo.com and entered your card details, you will automatically receive £5 bonus money into your new Slingo account. Your bonus cash will be valid for 7 days, so make sure you use it to play the games on the site during that time. You can use your bonus money to play any of the games. This includes the full suite of games. There are nine Slingo branded games, with Slingo Riches and Deal or No Deal Slingo featuring alongside Big Money Slingo and Slingo X Factor. There is also a massive selection of slots titles, including NetEnt games Starburst and Gonzo’s Quest, as well as Microgaming’s Immortal Romance and Thunderstuck II. Can I Keep The Winnings I Make With My Free £5? Firstly, your £5 free comes as bonus money and has wagering requirements attached to it. These are 60x on slots, 60x on Slingo games, and 8x on Slingo Boom, the bingo game. Only wagering with the bonus counts towards these wagering requirements. You can keep up to £100 worth of winnings accumulated from the bonus funds credited for this offer. If you should accumulate more than £100 in winnings then any winnings over and above £100 will be voided from your account. What Other Bonuses Do I Get When I Join? £5 Freeplay is not all new customers at Slingo.com are entitled to. With your first deposit you will also get a massive 300% deposit bonus – deposit £10 and play with £40 – and with your second deposit you will get a 100% deposit bonus – deposit up to £50 and they will double it. Where Else Can I Get a Free £5 or More? !